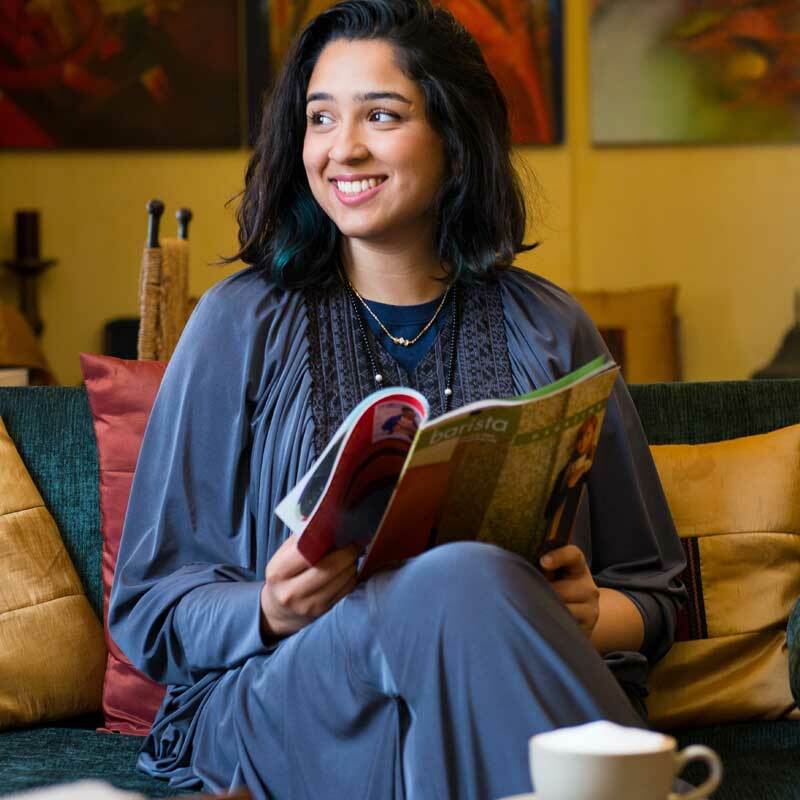 Raneen Bukhari grew up in what she calls “a business/art environment”, Her mother an artist and her father a businessman. In 1990, her parents opened Desert Designs, a space creating a fusion between culture and design. Upon graduation, Bukhari has been running the art gallery in Desert Designs and also manages marketing and development there. A creator and curator of LOUD Art, a traveling platform for emerging experimental artists, organized annually since 2012. She is a co-organizer of Huna Art, a casual art talk that has been happening bimonthly since 2013 and is now expanding to go beyond the confines of the gallery walls and create pop-up art shows in all kinds of locations. In 2017, she co-curated Live Demo, in February in Jeddah in collaboration with young upcoming artists and also a completed a curatorial course with the British Council that just ended in a show that opened in October in Athr under the theme of “We Are Not Alone”. A family run business since 1990, Desert Designs has grown manifold from the store opened in a desert tent, to its flagship storefront on King Abdullah Street in Al Khobar, Saudi Arabia. “Our vast collection of personally curated products, ranging from tribal Bedouin arts brought especially for you from the desert to modern executive gifts always created keeping the heritage of Islamic design in the forefront. Artists and Artisans are both given equal importance at Desert Designs. Host to its own contemporary art gallery, we continue to provide a platform for both upcoming and known local artists. We strive to create and promote culture, art, heritage and design through our space, products and services. Our constant goal is to create a fusion between cultures and tradition and contemporary design needs,” Raneen Bukhari told BTW. Tell us briefly about yourself: where you were born, your educational background, etc. I was born in AlKhobar. I grew up in a business/art environment”. My mother is an artist and father a businessman. In 1990, my parents opened Desert Designs, a space creating a fusion between culture and design. Upon graduation, I have been running the art gallery in Desert Designs and also manages marketing and development there. I studied MIS in university college of Bahrain. What is Desert design all about? Desert Designs is where culture and design meet. We started in 1990 with a mission to support artist and artisans and to bring value back to our traditional crafts and designs. We continue to have those same values today. Our products range from home accessories and furniture to regional designers products to the artwork. My mother studied art and my father worked in his family business selling high-end speakers. Both quite artistic fields. When they decided to open Desert Designs I was 3, and I basically grew up in a very art-rich environment. How did the concept of Loud Art evolve and can you explain more about the activities? LoudArt is a Desert Designs initiative emerging and experimental artists to show their concepts. We started in 2012 and have been growing with new destinations every year. My mother and my father. Always. I’m also very privileged to have strong women inspirations in my life. Tell us about the significance of art in your life. It is what all my plans, travel, and daily life revolves around. What have been the major challenges of your life so far? Managing to find my passion and then figuring out how to make money from it. Some kind of constant practice is needed to increase skills and knowledge if it’s academic or just self-taught. Desert Designs is here to support all artists needs! We hope to continue our activities in AlKhobar and in our new store in Bahrain and would love to host exhibitions, workshops, and any other ideas creatives have in the country.